Learn how the submissions process works and access our Order Form. 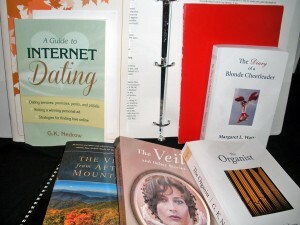 We edit, format, print, and bind books and other bound publications. You’ve written a book worth printing. Now, trust Devon Book Printing™ to edit and print it right. Devon edits, formats, prints, and binds books and bound publications of all kinds, from 3-ring manuals and 4-page pamphlets to 500 page novels, color brochures, and directories. We serve both commercial and personal clients and all writers, amateur and professional. We provide all of the services needed to turn your manuscript into a polished “book,” meaning any bound publication not intended for retail sale. This includes nearly all commercial and academic literature and most privately published or self-published literature. (b) if you plan to use your book internally in a business or organization. Devon is not for you if you have penned what you hope is the next bestseller and want someone to buy, publish, and distribute your book to booksellers. To reach the retail mass market, you will need an agent, publisher, book distributor, and\or Print-on-Demand printer. We provide none of those services. Our pre-press services – editing and formatting – turn manuscripts into correct, print-ready text. We offer two levels of services: General and Technical. Both choices feature the same quality of service, but address different levels of technical complexity. We offer digital and offset printing and a range of papers, inks, soft and hard bindings. We specialize in short-run projects (under 1,000 copies), but can handle larger production runs. Whether your bound project is commercial or personal, you can trust us to do it right. To begin the process, contact us, describing your book and indicating your preferred time for a free phone consultation with one of our editors. Generally, we schedule half-hour consultations from 9 to10 a.m. and 4 to 6 p.m. We will confirm a day and time by e-mail. We are always glad to talk with authors about their work. A little advance planning can save time, money, and aggravation. Upon our acceptance of your book project, you will receive a tracking number, a quote (an estimate of the project costs), and submission instructions. License to use issued to Devon Book Printing, a division of Devon Home, LLC of Virginia, P.O. 9958, Richmond, VA 23228. Copyright 2019 © Gary Keith Nedrow. All Rights Reserved.